Since her first trip to Matanzas, Cuba, in 2001 to study Lucumí songs from the Santería tradition, Shyu has traveled to Brazil and Vietnam, and to places connected to her own ancestry: Taiwan, her fathers homeland, where she studied Hengchun minyao, a Southern folk song tradition accompanied by the gat kim, the 2-stringed Taiwanese moon lute; China where she researched shuochang, a form of narrative performance that involves a combination of singing and speaking; and East Timor to research and document the music of her mothers birthplace. Soon after she released Synastry (Pi 2011), an album of duets with bassist Mark Dresser, Shyu departed for Java, Indonesia, on a Fulbright for almost two years during which she studied sindhenan, the improvisational singing of Javanese gamelan music, and took fieldwork trips to Kalimanthan, Bali, East and West Java. Toward the end of her stay, she spent six months in South Korea studying the traditions of pansori (musical storytelling) and gayageum byeongchang (singing while playing the gayageum, a 12-string zither like instrument). A year later, she went back to Korea for another six months to further deepen her linguistic and musical studies. This peripatetic itinerary is not arbitrary: her focus is on music that is rarely heard outside of their regions, especially narrative storytelling from women and shamanic chant from ritual ceremony. Her approach is completely opposite to the sometimes slickly-produced Western notion of “world music,” which is often only interested in mining foreign cultures for its surface exoticism. Shyu, on the other hand, fully submerges herself in the language, culture, history, musical traditions and ritual practices at each of her destinations with heartfelt intensity. What arises from her is an authentic offering that is both grounded in its solid foundation and groundbreaking in its singularity. Sounds and Cries of the World is an intimate reflection of Shyus absorption and study of all of these musical traditions and revelations. Singing in English, Korean, Indonesian, Javanese, and Tetum – she is also fluent in Mandarin, Portuguese and Spanish  her lyrics evoke a range of emotions from plaintively wistful to emotionally anguished, with imagery that is by turns brutally explicit and fantastically surreal. Much of the music has a free-floating feel progressing via internal cues in a system that Shyu was developing before going to Indonesia and further solidified after her Javanese gamelan studies of palaran, in which the form follows the sung melody. The music sounds free across a steady pulse, but in actuality, everyone including the singer must listen and be perfectly aware of the order in which all the instrumentalists’ cues fit together before they move forward. Helping her carry out her vision are the remarkable contributions from Ambrose Akinmusire on trumpet, violist Mat Maneri, bassist Thomas Morgan, and drummer Dan Weiss. Each one is a master improviser completely attuned to the musics lush and subtle flow, allowing the melody and harmony to breathe and shift organically. Shyu’s voice stands in sharp relief: her enormous vocal range, refined control of shadings and textures, deep sense of rhythm, and ear for lyrical improvisation all exist to get to the kernel of some clear emotional truth. All the compositions here are original works except for tracks 3, 5, and 9, where she involves traditional melodies to which she feels particularly close. Each song features a great deal of improvisation within the structure of the music. 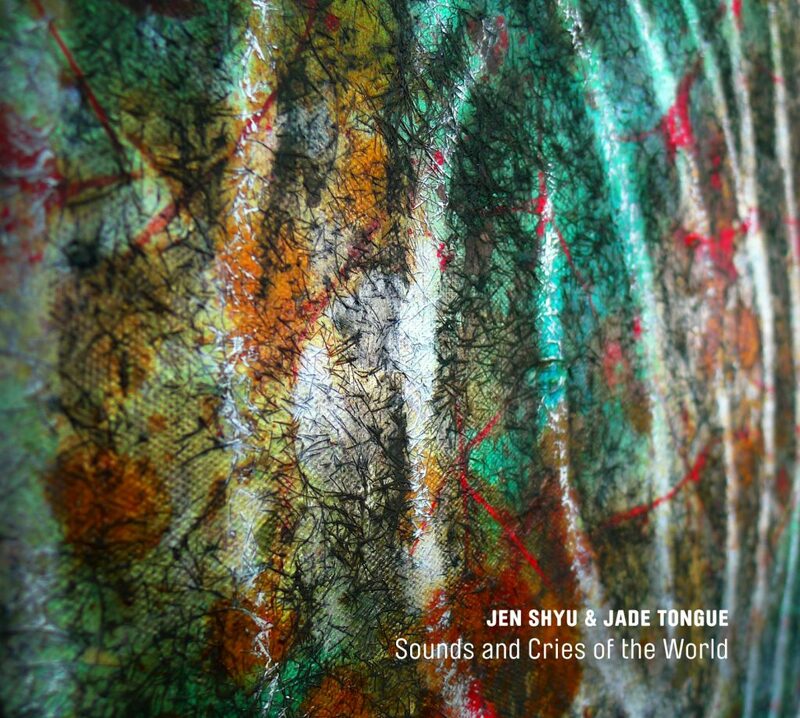 Half of the compositions on the album (tracks 5 through 9) are taken from Shyu’s multi-disciplinary one-person performance piece Solo Rites: Seven Breaths, which saw its premiere at Roulette Intermedium in Brooklyn, New York in 2014. That work, a collaboration with the acclaimed Indonesian film and stage director Garin Nugroho, encompasses theater, dance, and Shyu accompanying herself on a variety of instruments. A dramatically powerful, often frightening work filled with longing and sorrow, it is a brilliant distillation of ritualistic traditional music and the power of the voice to transport an audience to an altered state of consciousness and far-off emotional space. But the songs on Sounds and Cries of the World also celebrate and honor the musical cultures and people whom she has encountered in the course of her travels: both the studies with elder practitioners of ancient rituals and the collaboration with contemporary artists who join her in creating new variations on these forms. Case in point is the song “Mother of Time,” which marries Shyu’s English lyrics, inspired by a Taiwanese poem, with a melody based on a Javanese song that ends with a Korean ritual prayer. It all miraculously comes together seamlessly, a testament to Shyu’s complete immersion into each of these art forms and the strength of her intuition and creative voice. While she still considers jazz at the core of what she does musically, Shyu is intrepidly forging her own way, creating music with complete disregard for notions of style or genre. MacArthur Fellow Steve Coleman says of Shyu: “What has impressed me has been how hard Jen works on her projects; on the musical composition, the performance, and on the connection between the music and the underlying symbolism. It is extremely rare for a vocalist to make this kind of complete contribution to the world of creative music. This path requires a unique blend of musical skills, a passion for original research, an insatiable curiosity, and an ability to merge seemingly disparate elements into a holistic expression. Jen’s work sets an excellent example for future vocalists and musicians. The world definitely needs more creative work on this level.” Looking to the future while seeking inspiration from the deeply-rooted past, Shyu has created a sui generiswork of art that is impassioned, ecstatic, and ultimately transformative.